Yesterday, a walk to the pool took an unexpected turn when the Wee Boy took a spill on the sidewalk and landed on the back of his head. Later, he vomited and lost consciousness several times. Long story short, he had a concussion and spent the night in the hospital. He’s ok now, but I have a list of symptoms to watch out for. It was awfully scary!! he woke up happy and hungry! 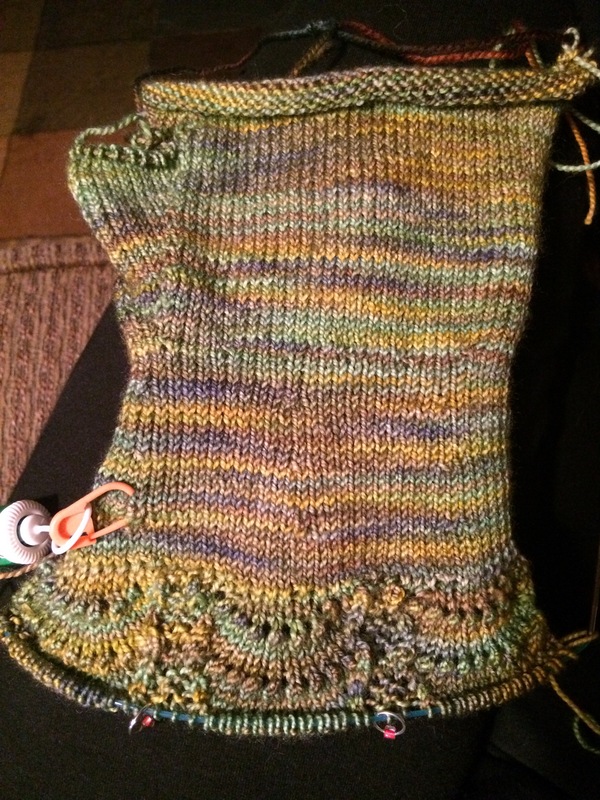 In knitting news, I picked up the stitches for the feather and fan edging of my first Splatterdash mitt. About three repeats in, I found that I had picked up the stitches on the lower instead of left edge. Sigh. Aiya! Poor baby. Head injuries are scary. I’m sure he is fine now. At least he looks good and happy in this photo. I like the mitt. The color way is like the scales of a snake.